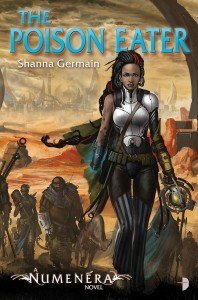 Venture into a whole new realm – Numenera, the Ninth World in Shanna Germain’s inventive science fantasy, The Poison Eater. It’s a brilliant far-future tale magic and technology, from the Numenera world developed by Monte Cook Games. Let us treat you an exclusive peek at the first chapters of Shanna’s extraordinary story. The wonderful James A. Moore has written an exclusive short story for all you fans of the Fellein Empire. Did you love Seven Forges and can’t wait until The Blasted Lands is released? Immerse yourself in the mountainous world, and count the days down until The Blasted Lands is published, which is currently 38 days, 8 hours, 23 minutes, and 32, 31, 30, 29, 28…. seconds. The Age Atomic, by Adam Christopher, The Marching Dead, Lee Battersby and Black Feathers by Joseph D’Lacey are all officially on-sale in the UK/EU next week (from Thursday 6th to be precise), but are already our in US/CAN print and ebook editions. It’s free samples time again! Check out these multi-chapter extracts from our three January 2013 releases: near-future science fiction thriller Nexus by Ramez Naam, Elizabethan swashbuckling and skullduggery saga The Merchant of Dreams by Anne Lyle and the three-in-one omnibus edition of the steampunk extravaganza The Bookman Histories by World Fantasy Award winner Lavie Tidhar. All three books will be on-sale in print in the UK/EU from January 3rd 2013, slightly earlier in the US/CAN, and in ebook from December 18th from all your favourite book retailers. Our September titles are almost here (so close, you can almost taste ’em), which means that before too long you’ll be able to rush to your favourite bookstore (or click around on your favourite online retailer’s website) and buy multiple copies of The Corpse-Rat King by Lee Battersby, Seven Wonders by Adam Christopher and Mockingbird by Chuck Wendig, then run around handing them out to family and friends like they were toffees. Here’s another batch of sample extracts for you to read and enjoy. With the official US publication date of both Carpathia by Matt Forbeck and Dead Harvest by Chris F. Holm finally upon us and the official UK publication date just a couple of days away, it’s long past time that we posted a couple of free excerpts from the books in question. So here you go. This week, two of our favourite genre sites are running excerpts from Aliette de Bodard‘s fabulous Aztec Magick Murder Mystery, Servant of the Underworld and Lavie Tidhar‘s equally wonderful steampunk romp, The Bookman. Starting today, and running every day until Friday, you can read an exclusive extract from the books.